I’m coming up on my second anniversary as a First Sergeant. I’ve loved it, and whenever the time comes to go somewhere else, I’ll salute and do as directed, but I won’t exactly be thrilled about it. These guys have quickly become family, and I want to be able to take care of them for as long as I can. Some of the lessons here weren’t exactly blinding revelations (though being a First Sergeant gave me a different perspective on them), but others were things I really hadn’t expected. # 1 Take advantage of every opportunity to teach. I like to teach as it is, and I’ve always particularly enjoyed that aspect of the NCO’s responsibilities. It was not until I became a Platoon Sergeant that I had the opportunity to observe each of my squads as they trained and add my two cents to what they were learning. As a First Sergeant I have that same opportunity on a larger scale, though I’ll grant that my administrative responsibilities now compete more than they did when I was an E-7. Like anything else there’s a balance to be struck—your subordinate NCOs need the chance to teach as well, so you can’t trample them in your haste to dispense bits of wisdom—but it’s gratifying to be able to instruct both enlisted Soldiers and NCOs and watch them grow. # 2 You might be surprised at what you can do. # 3 In a lot of ways you are the unit, so make your Soldiers proud. This one was a bit of a surprise. I didn’t realize how much my Soldiers would identify me with the unit until I participated in my squadron’s Spur Ride last year. (This is a cavalry tradition in which the participants undergo a day and a half of physical and mental challenges and general unpleasantness in order to earn their spurs.) That was when it became clear that I was intertwined with their unit pride. I wanted to succeed in the Spur Ride anyway, obviously, but once I realized what my personal performance meant to the unit, failure was not an option. That realization now plays into my every action. # 4 The little things mean more than you might think. Just this past week, we were given the option to laterally transfer Soldiers to corporal. At drill this weekend I sat down with my Platoon Sergeants and Platoon Leaders to decide who I would recommend. Sunday afternoon we brought in the Soldiers we had selected and made the announcement to them. I expected them to be pleased and proud, which they were, but the looks in their eyes were worth more than I can describe. The rank of corporal doesn’t mean any more money for them; in fact, it’s just more responsibility for the same pay. But the confidence we expressed in recommending them clearly meant a lot to them. # 5 It’s not about the rank; it’s about what you can do with it. This is something I told my NCOs when I was a Platoon Sergeant. Pinning on more stripes isn’t about “look at me and my rank.” It’s not about you at all. It means more responsibility and more power to take care of your Soldiers. As a First Sergeant you tend to be treated deferentially. While respect for rank is a necessary part of military culture, I don’t think of myself as special. Rather, I now have new power to protect and do things for my Soldiers, both by teaching and influencing my subordinate NCOs and by interceding with the Command Sergeant Major. Two years as a First Sergeant is just the first few steps along the path. I will spend years at this rank, and I could very well retire as an E-8. I expect to learn much, much more in the coming years. These five lessons are just scratching the surface, so hopefully I’ll be back in a few more years with more lessons to share. Daniel Slone is a 16-year infantry veteran and currently the First Sergeant of a light reconnaissance unit of the Louisiana Army National Guard. In civilian life he has earned a BA in political science and an MBA and is the controller for a holding company engaged in multiple lines of business. Very good post Sergeant Sloane! We just cannot allow power to go to our heads, because essentially we are servants, both to the U.S. Army and to the men and women we lead. I believe I would be proud to have you as my First Sergeant. 1SG…it sounds like you are in the same kind of unit as my husband, and you are both infantry, so I am going to show him this article. I agree that it is the small things. I also agree that we should feel honored to wear the rank we have, and not use it to rub in other people’s faces, or as some kind of entitlement. The Army has entrusted us as leaders and we need to remember that always. Soldier care is #1 and the things you listed in your article are things that achieve that goal. Great post. 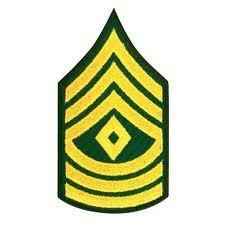 My goal is to retire from the Army as a First Sergeant in 10 years from now. I am currently an E-6, but would like to make the rank of E-8 before I retire. I truly believe that 1SG is the best job (and hardest job) in the Army. You share some great lessons you learned during your time as a First Sergeant, Daniel. I really like your lesson about how the little things count. I’ve always believed it’s the little things that make all the difference. Examples might include telling a Soldier you appreciate them, helping your Soldier get the school they want, helping your Soldier solve a family or financial problem, or even writing a thank you card for one of your Soldiers. All of those things can have a huge impact on morale. I also like your comment that it’s not about the rank, it’s what you can do with it. I’ve always believed that the more rank we have the more responsibility we have to serve the people below us. As we progress through the ranks we must never forget where we came from. We must always strive to take care of our Soldiers and subordinates.